Johannes Acronius. Portrait by Frans Hals (1582/1583–1666) [Public domain], via Wikimedia Commons. Johannes Acronius, Reformed divine, son of Dominicus Acronius, born 1565 at Grimersum in East Friesland, died at Haarlem in 1627. 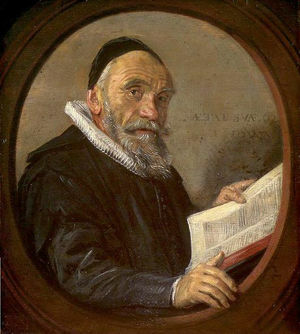 He studied in Neustadt a.d.H., Germany (at the Casimirianum), under Ursinus and Franz Junius, in 1584 became a preacher in Eilsum (Dutch province of Friesland), in 1601 in Groningen, and in 1611 in Wesel. In 1614 when Wesel was destroyed, he fled to Deventer. In April 1617 he was made professor at the university in Franeker, in 1618 became preacher in Kampen and delegate to the national synod in Dordrecht (1618-1619). From 1619 until his death (29 September 1627) he was stationed in Haarlem. While at Groningen he was very influential in the provincial synod and was appointed plenipotentiary in Drenthe by William Louis of Nassau. He thrice refused a call to Amsterdam as preacher. In 1602 he was involved in an argument with the Mennonites led by J. C. Rolwagen. Against him he wrote Apologia ofte Verandtwordinge des Edicts . . . tegen der Wederdooperen . . . (Groningen, 1602). Vos, Karel. "Acronius, Johannes (1565-1627)." Global Anabaptist Mennonite Encyclopedia Online. 1955. Web. 25 Apr 2019. http://gameo.org/index.php?title=Acronius,_Johannes_(1565-1627)&oldid=128573. Vos, Karel. (1955). Acronius, Johannes (1565-1627). Global Anabaptist Mennonite Encyclopedia Online. Retrieved 25 April 2019, from http://gameo.org/index.php?title=Acronius,_Johannes_(1565-1627)&oldid=128573. This page was last modified on 16 December 2014, at 20:09.